Perry Behavioral Health Choices is hosting an Alumni Harvest Dinner on Saturday, October 27, 2018 from 6:00 p.m. to 9:00 p.m. at the PBHC Activity Center - New Lexington, OH. 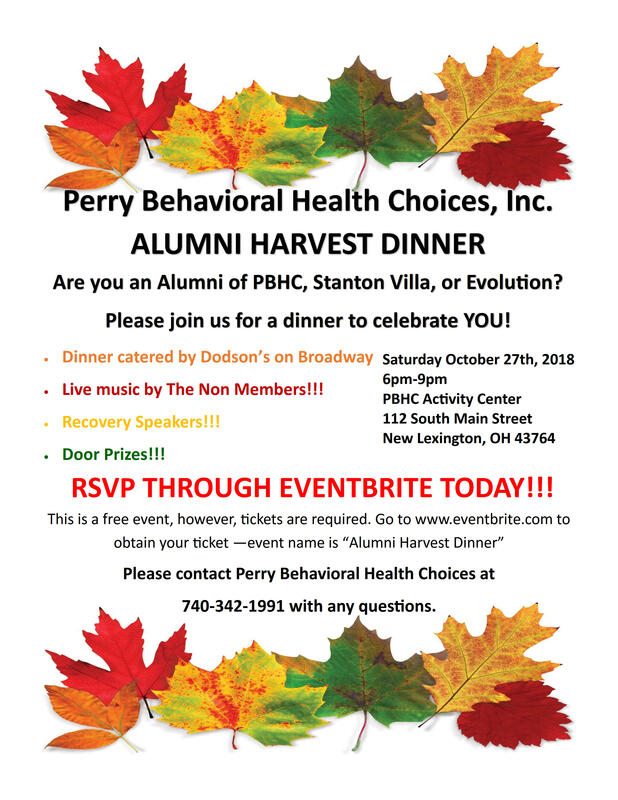 Perry Behavioral Health Choices is hosting an Alumni Harvest Dinner on Saturday, October 27, 2018 from 6:00 p.m. to 9:00 p.m. at the PBHC Activity Center - New Lexington, OH. This dinner is for alumni of PBHC, Stanton Villa, and Evolution. Click HERE to get your free ticket. Event name is "Alumni Harvest Dinner."